My name is Gary Charles, I am an artist and/or musician, and have been making music in one shape or other since I can remember. In the past, I released music under a number of monikers, but the one used most is The Static Hand which features primarily electronic music, veering towards the sparse, ambient, or drudgy – yet occasionally finding the dance floor. I also play in pure improvisation groups, including work with ambient guitarist Miguel Gomes (Be My Friend In Exile). Lastly, I also lecture part-time in computer music and sound design. Where are you based? Would you like to share anything special about the local scene you are a part of? 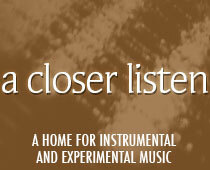 I am based just outside Oxford, a decent environment for sound art and experimental music. I am an associate practitioner at the Sonic Art Research Unit (SARU) at Oxford Brookes University, having studied there. As part of this mix, there are some examples of work from colleagues here in Oxford (Harriet Butler, Jenny Wylie & Sam Kidel). For such a small place, there is also a fairly rich pop music history, having produced the likes of Ride, Radiohead and Foals. A personal current favourite of mine on the local scene is a psych / post-punk trio called Lucy Leave. Tell us about Set Your Maps To Zero. The mix was put together in Ableton Live by combining a broad range of sound sources and sound files, including field recordings, music technology demos, reversed advertising, and some recent tracks I have been listening to. In particular, look out for some Gqom sounds coming out of the KwaZulu-Natal region of South Africa (a place close to my heart), and the brilliant Matthew Herbert‘s (hot) take on Royal Weddings provides some topical content. I have also included the soundtrack to a recent art project I was involved in, looking at the privatisation of security services, and the absurd marketing methods these firms use (www.mosquitolightning.com). My approach in putting the mix together was very much a case of compiling and moving files around a timeline, then playing and experimenting as much as possible with automated effects and changes – essentially trying to play the stone cold wav files like a musical instrument. What’s coming up on the horizon for you? The most recent album from The Static Hand (called Lemsip Days) was released towards the end of last year, so is really still just a baby. Coming up this year, I am taking part in the Audiograft Festival during March in Oxford, and showing work at one of the Reading International Fringe Events. Lastly, I am curating a show in New York called Scenes From A Chasm, at Cuchifritos Gallery in East Village, opening in June. Further details will appear on my website.